You can connect Chromecast Audio to a speaker (or a sound bar or even your home theatre system) through the 3.5mm audio cable. Chromecast Audio instantly turns your speakers or sound bar into a “smart” and “connected” device. It can stream music from the cloud or from your phones or other devices. Please check Chromecast Audio guides here. It does not drain phone’s battery because your phone is just a remote control if you stream music from the internet. You can use the phone for any other activities. You can make or receive calls while enjoying the music. Even the old speakers in your garage will work with Chromecast Audio as long as it has a 3.5mm jack. Better audio quality than many old Bluetooth devices. Chromecast Audio is NOT a strip-down version of Chromecast. Chromecast Audio actually has almost identical specifications to the HDMI-interfaced new Chromecast. The major difference is the output. The under-hood software is slightly different. Please check this page on the differences between Chromecast and Chromecast Audio. Update: Google Home works similar to Chromecast Audio + a speaker. 2. New Chromecast has a new design, and is colorful! The new Chromecast is re-designed, and you have 3 color options for the new Chromecast (Chromecast 2015). One major complaint of the 1st generation Chromecast is the bulb-like shape which is not friendly to other HDMI devices. It may leave litter space for other HDMI cables/devices. In the new Chromecast, the HDMI cable is attached magnetically to the device (and to the TV as well) and is flexible. So, the new Chromecast will not affect the positioning for other HDMI devices/cables. The new Chromecast is now disk like with Chrome logo in the top. It is very interesting that Google offers 3 colors for new Chromecast. 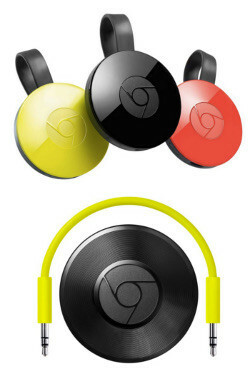 In addition to the always-correct black color, you can also get a red Chromecast or yellow Chromecast. Anyway, very likely, Chromecast is placed behind the TV. Therefore, the color for most Chromecast users maybe not so important. But if you want to give this $35 new Chromecast as a gift, or if you put the Chromecast on the TV bench, you will appreciate the color options. The old Chromecast (Chromecast 1st generation) only supports 2.4GHz WiFi. It is proven it is a serious problem for high-quality video streaming. Although Google offered a $15 Ethernet adapter for Chromecast to partially solve the connection issue, most owners expect dual-band 2.4/5GHz support. The new Chromecast solved the connection speed issue. Dual band and 802.11AC support in the new Chromecast (Chromecast 2015) surely is sufficient for all Chromecast owners. To make it even better, new Chromecast adopts new antenna design optimized for WiFi streaming. Please note, 4K and HDR support is only available on Chromecast Ultra. With the launch of new Chromecast, two new features for the new Chromecast were introduced: Fast Play and Chromecast gaming. Fast Play in the new Chromecast can pre-fetch video contents for the supported video streaming app (e.g., Netflix). You will be able to enjoy your video faster (less waiting time). Chromecast gaming let you enjoy the game on the big screen. It is faster and more responsive than screen casting. The game developer can add more features to the game. And it is possible to make your phone as a game controller with Chromecast gaming. Of Course, both Fast Play and Chromecast gaming require supported apps/games. App developers need to add some codes to benefit from these features. Before announcing the new Chromecast devices, Google just updated the Chromecast app. Some features are very useful, for example, What’s On lets you browse popular and featured content from your favourite cast-enabled apps. Of course, the new features in the updated Chromecast app also available for the 1st generation Chromecast. Please follow this guide on how to use the new Chromecast app. What’re your thoughts on the new Chromecast and the Chromecast Audio? Please share your thoughts on the new Chromecast (Chromecast 2015) and Chromecast Audio in the comment box below. For guides for Chromecast including both 1st generation Chromecast, new Chromecast (aka Chromecast 2015), Chromecast 2018 and Chromecast Ultra, please visit Chromecast how-to guides page. Seems like two fantastics additions. I have always hated, that i had to turn on the TV, in order for me to play music through my reciever. Also the added Spotify support, is spot on here in Denmark, where it is the most popular service. Yes, Chromecast audio exactly solves the issue. More music streaming providers will support it. Only reason I would upgrade is if the new Chromecast supports more audio and video codecs. I ripped my DVD collection years ago and have it stored on an external drive plugged into my router. It’s frustrating that a third of my videos don’t play on my Chromecast! You can always use some free programs to convert them into other supported formats (for example mp4). the popular media player vlc player can convert most videos. There are many other tools. I would have loved it if there was a dual-use Chromecast. Just add a 3,5mm jack socket along with HDMI out – Voila! One device to suit all needs. Many owners will get confused and configure it wrongly. Chromecast device is targeting the mass market, not just geeks.